There’s something fun about eating foods at the wrong time of day. Pizza for breakfast or cereal for dinner is so much more interesting than eating either one in their typical time frame. Of course, eggs are one of those elemental foods that transcend the confines of time. What would Vietnamese com tam and grilled pork be sans oeuf? Or a big bowl of ramen noodle and pork belly soup from Momofuku Noodle Bar without the egg? My favorite way to eat eggs at night though is on a Bistro Salad, the simple dish of frisÃ©e lettuce, bacon, croutons and a runny poached egg in a tangy vinaigrette. 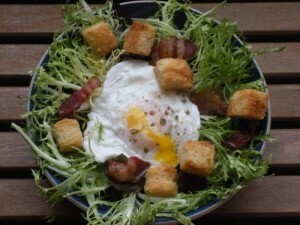 Some people call it FrisÃ©e Aux Lardons or Salade Lyonnaise. But that latter can also refer to a salad that comes with a tasty surprise of chicken liver, lamb trotters or offal that’s popular in Lyon. No matter, once you taste it, you’ll be calling it one of your favorite salads ever. In a large bowl, toss the baby greens with the vinaigrette. Season with salt and freshly ground pepper. To assemble the salad, divide the salad greens between two salad bowls. Lay two of the soft poached eggs on the greens in each bowl. Sprinkle half the bacon pieces on each of the bowl. Top with the Brioche Croutons and serve. Remove the crusts from the brioche slices and then cut them into cubes that are about 1/2 inch square. Put the brioche cubes on a baking sheet. Reserve the crusts for another use if you like. Combine the melted butter with the olive oil. Drizzle the butter mixture over the brioche cubes, tossing them lightly to make sure they are well-coated. Put the cubes in the oven and let them brown for 15 minutes. Halfway through, using a spatula to turn them over. After 15 minutes, the croutons should be a golden brown and fragrant with a toasty buttery smell. Remove from the oven and sprinkle with sea salt. Let cool and store in an airtight container until ready to use. Make more of these than you think you will need; you will eat a bunch of them before they ever hit the salad.